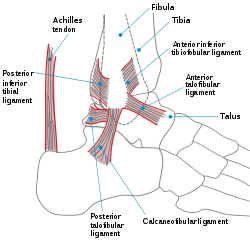 "The Ankle". University of Glasgow. 2007. Retrieved March 2010. Ardizzone, Remy; Valmassy, Ronald L. (October 2005). "How To Diagnose Lateral Ankle Injuries". Podiatry Today. Retrieved March 2010. Haddad, Steven L. (ed). "Foot & Ankle". Your orthopaedic connection (American Academy of Orthopaedic Surgeons). Archived from the original on 23 March 2010. Retrieved March 2010.